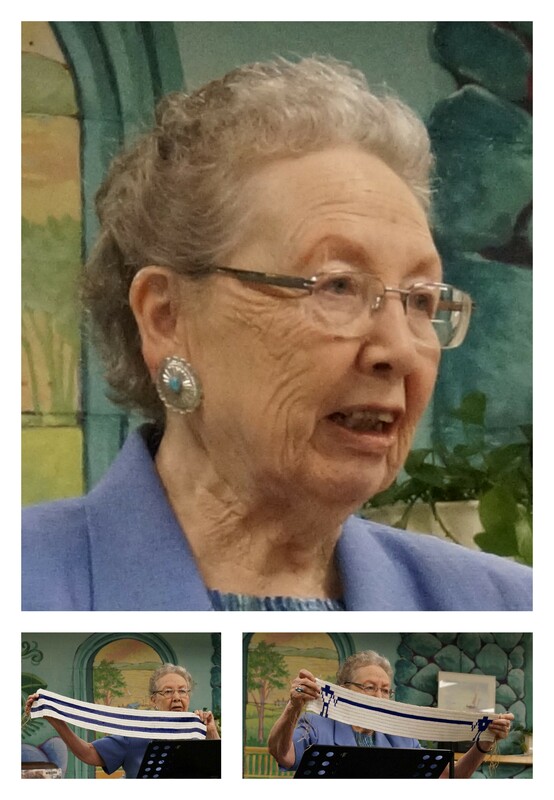 Marlene Brant Castellano got our summer series of local history talks off to a great start with her examination of the local history of the Bay of Quinte from a Mohawk perspective. Marlene used reproductions of two famous wampum belts to tell the story of the Mohawk people’s interactions with Europeans, beginning with the treaty represented by the Two-Row Wampum in 1613 with the Dutch. The two purple rows of the belt were intended to show the parallel courses of a European ship and a Haudenosaunee canoe, bound together by friendship, peace and respect. The other belt, the Friendship Belt, represents the Covenant Chain connecting the two peoples: a chain of silver which needs to be regularly polished by both groups in order to maintain its shine. Marlene got the audience involved from the beginning, with questions about the importance of family roots and stories and what they mean to us. Until recently, formal education in Canada paid little or no attention to native people’s own histories, while the use of native languages was actively repressed for many years. Marlene noted that this has now changed and Indigenous children are now able to connect to their stories and language in a way that people of British descent may have taken for granted in the more Anglo-centric teaching of the past. The stories associated with wampum belts have endured within these communities for hundreds of years, and Marlene explained that a thorough knowledge of their meaning and importance is a key part of being a chief. A chief, she noted, is an archivist, as well as a leader! 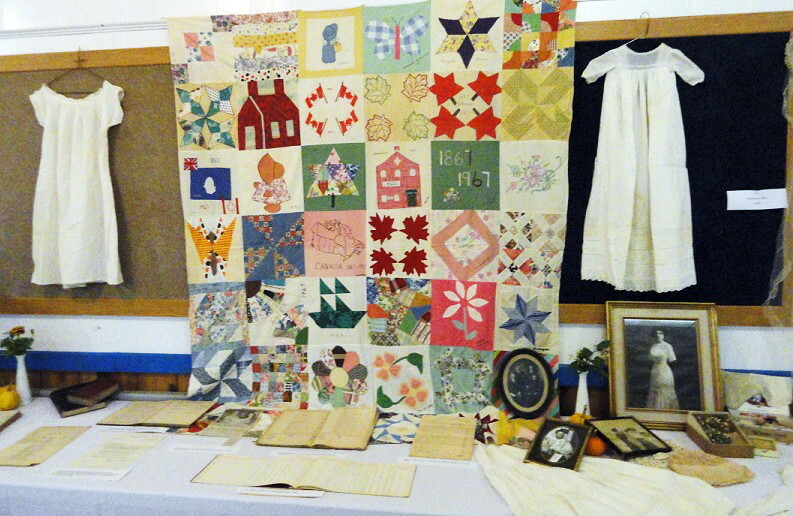 Tomorrow sees the first in a new series of talks on local history. 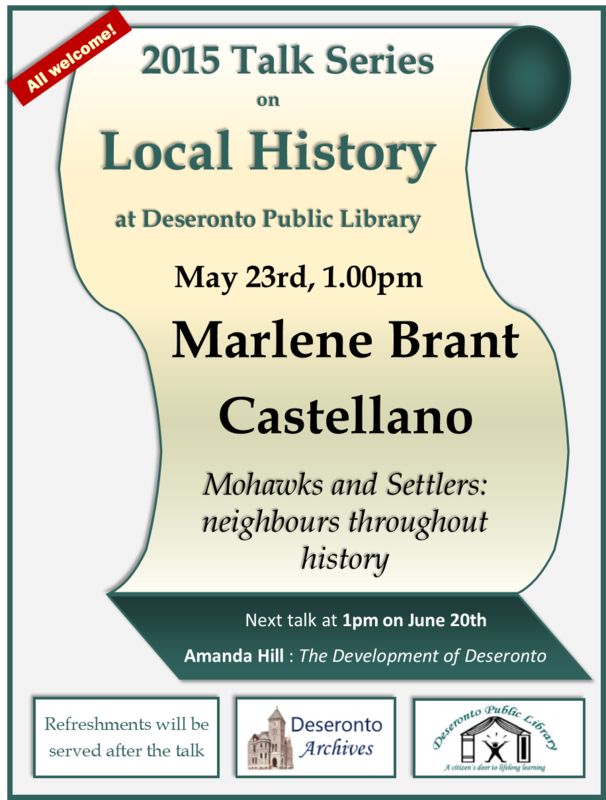 We are delighted to welcome Marlene Brant Castellano to Deseronto Public Library to talk on the topic of ‘Mohawks and Settlers: neighbours throughout history’. The talk is free to attend and all are welcome. It starts at 1pm and will be followed by refreshments. We hope to see you there! The next talk in the series, ‘The Development of Deseronto’ will take place on June 20th (same time, same place). Library and Archives Canada have made the 1921 census available through Ancestry.ca. The census has not yet been indexed (which means it can’t be searched by name at present), but it is available to browse. You need to sign up for a free Ancestry account in order to see this, or you can get access without having to sign up if you use Ancestry from a public library which has a subscription to the Ancestry service (most libraries in Ontario do). To see the entries for Deseronto, you’ll need to select ‘Ontario’ from the menu on the left of the Ancestry 1921 page, then go to the ‘Hastings East’ district. You’ll find that Deseronto is covered by three sub-districts: 44 (Centre Ward), 45 (East Ward) and 46 (West Ward of the town). 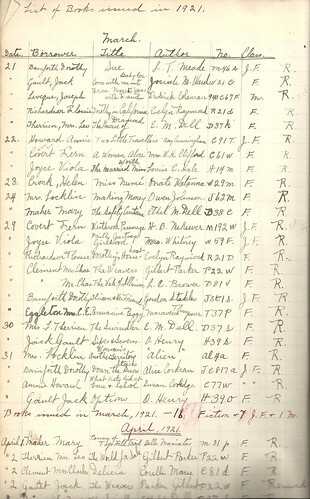 This census was taken on June 1st, 1921. 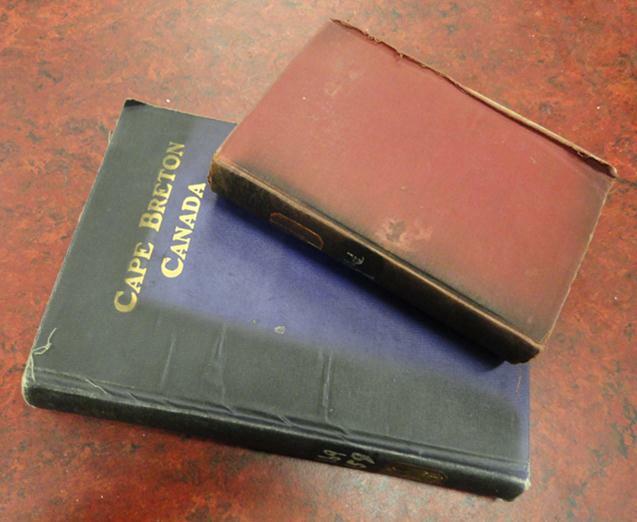 And speaking of libraries and 1921, we’ve just digitized the first ten pages of Deseronto Public Library’s register of books borrowed in March, April and May 1921. This volume was maintained by Deseronto’s fourth librarian, Flossie Hall.1 So if you do find a Deseronto relative in the 1921 census, you can also check the borrowing register and see what they were reading! The books aren’t available in the library itself these days, but you can find scanned copies of many of them online through Project Gutenberg, the Internet Archive and the Open Library, to get a taste of what people were enjoying back in 1921. 1 There’s a photograph of Flossie featured in this earlier post. At the musical evening held as part of the Library’s 125th anniversary celebrations John Hall, the Organist and Director of Music at Christ Church and the choir of the church sang the following song as a tribute to the work of Frances Smith, Deseronto’s current librarian, and her team. We’re hoping to get a video made of a repeat performance to share here, but in the meantime, here at least are the words (with apologies to W. S. Gilbert) to give a taste of the event (and for re-use and adaptation, should you feel so inclined!). And if you need the washrooms then I’ll tell you where you have to go. I understand MARC records and all issues biographical. We’ve books on everything from kangaroos to paying income tax. I am the very model of a modern-day librarian. If you want to build a house or simply just learn how to cook. We’ll even help you out if you forgot to bring your reading specs. Thanks to everyone who attended this and all the other events which marked this anniversary. This is a difficult time for libraries and it was wonderful to see so much support for the service. The Library will have some of these items on display all this week, so do take a chance to drop by and see them if you are in the area. Other events at the Library this week include a free music concert on Thursday October 20th at 7pm and a free afternoon tea event on Saturday October 22nd between 2pm and 5pm. Deseronto Public Library traces its roots back to the foundation of the Deseronto Mechanics Institute in 1885. Mechanics’ Institutes were established as a means of providing educational opportunities for working men. Many of them provided lectures, social events and reading rooms for the use of their members, who paid an annual fee for access to these facilities. A public meeting was held in the Town Hall on October 27th, 1885 to discuss “the propriety of forming a Mechanics Institute in the Village of Deseronto”. The attendees were assisted in their deliberations by Mr McGowan and Mr Scott, members of the Napanee Mechanics Institute. It was unanimously resolved that it was “expedient to form a Mechanics Institute in Deseronto” and Dr John Newton, Deseronto’s physician and Reeve, was elected as the President of the Institute. On November 11th, the first Library Committee was established “to select books and prepare a catalogue”. At the same meeting it was agreed that “Mr E. A. Rixen be Librarian and Miss Millie Anderson be Assistant Librarian”. Ebenezer Arthur Rixen was the Rathbun Company’s accountant and his involvement with the library was to continue for many years. The Mechanics Institute library would be open from 7pm to 9pm on Tuesdays and Saturdays and 3pm to 5pm on Thursdays. Rooms for the Mechanics Institute were secured from George Stewart, one of the Directors. The location of these rooms is not known but Stewart was the proprietor of the Deseronto House Hotel on Main Street and it is possible that the rooms were located within that establishment. In May 1887 the Institute paid for gas lighting to be installed in the rooms rented from Stewart. 80 feet of gas pipes were needed, at a cost of 15 cents a foot. The first salaried librarian to be employed by the Mechanics Institute was Alva Solmes, who was also the caretaker for the rooms. He was taken on in May 1889 at a salary of $25 a quarter. Mr Solmes was a 43-year-old shipwright who had been born in the USA. By this time, the Institute was looking out for new accommodation and in 1890 the Directors were discussing building a new library with an adjoining Opera House. Estimates for such a building were received in September of that year but the depressed state of trade at the time meant that the idea was shelved. In October 1890 the President of the Institute, Frederick Sherwood Rathbun, reported that he had obtained new accommodation for the Institute in Godfrey Colp’s new block. This building was situated on the southwest corner of Edmon and St. George Streets. The rent for the new rooms was to be $150 a year, payable quarterly. The Institute moved into its new home in 1891 and a new caretaker/librarian, Arthur P. Brown , was employed in the same year. The Institute faced financial problems and by the mid-1890s was running an annual debt in excess of $300. Efforts were made to increase membership but the problem was resolved when a change in the law in 1895 permitted the conversion of Ontario’s Mechanics’ Institutes into free Public Libraries. Ontario had passed the Free Libraries Act in 1882, the first of its kind in Canada, which allowed municipalities to establish public libraries supported by tax dollars rather than membership fees. The 1895 amendment resulted in Mechanics’ Institute libraries being converted into free libraries from May 1, 1896. If the Directors of the Institutes agreed, the management of the libraries would be taken over by a Public Library Board and funding provided by the municipality. As a result of this Act, the number of public library boards in Ontario rose from 16 in 1894 to 54 in 1896. At this date, the annual running cost of the library in Deseronto was $250. 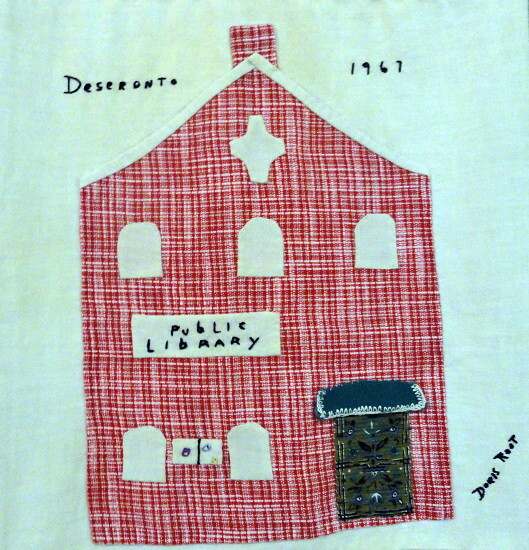 A public meeting in the Mechanics Institute on April 10, 1896 elected the first Board for the Deseronto Public Library. Its Chair was Frederick Sherwood Rathbun, Treasurer of the Town Council and brother of Edward Wilkes Rathbun, Mayor of Deseronto and head of the Rathbun Company. The new Public Library took over the Mechanics Institute’s books (including their Minute Book!) and premises and continued to employ Arthur P. Brown as its Librarian at the same salary as before. A set of Rules and Regulations for the library were drawn up. Arthur P. Brown was born in Ireland in 1847 and came to Canada in 1881. His time as Librarian was not without its moments of controversy. In 1898 the Board noted that he was refusing to lend certain books to particular individuals. 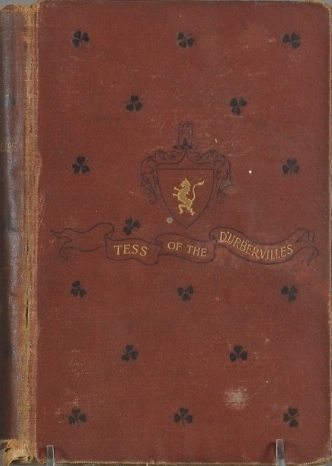 It was decided that “we should not have books in the Library about which there was any reasonable doubt” and a number of books were “expunged entirely” from the collection as a result, including Thomas Hardy’s Tess of the d’Urbervilles: now seen as a classic, but apparently too controversial for some of Deseronto’s citizens in 1898. The Board minutes noted on October 1st, 1901 that “many complaints are being made of the discourteous treatment received by the patrons of the Library from the Librarian”. It was resolved that the Secretary of the Board “be empowered, on a recurrence of the treatment complained of, to call a special meeting of the Board with a view to the selection of a suitable successor to the present Librarian”. Despite this reprimand, Mr Brown continued in the role of Librarian until 1915, with a total of 24 years in the post. By the early years of the twentieth century the condition of Colp’s block was giving the Library Board cause for concern. At this time, the millionaire industrialist Andrew Carnegie was funding the construction of public library buildings: over 2,500 around the world and 111 in Ontario. The Board wrote to Carnegie in 1901 asking about the construction of a library in Deseronto. At this time, the Town Council was using the Library’s rooms for its meetings and it was hoped that a shared building suitable for use as a Library and Town Hall could be funded. However, the terms of the Carnegie grants were for dedicated library buildings only and so the chance of having a Carnegie library in Deseronto was lost. In June 1909 the Library moved to rooms above the Fire Hall on Edmon Street. The move was costly: the Librarian being paid $1 a day to move the books. It took 20 days to complete and the cost plunged the Library into another financial crisis. A meeting was held on October 28th, 1909 at which it was noted that the Board wanted to discuss the future of the Library with the Mayor and Reeve as “funds were exhausted and the Board was in debt”. The Library continued to function in its location on Edmon Street until 1931 when a fire in the building caused extensive damage to the books. Some of them were sold off after the fire but others were trimmed and returned to the shelves. Several of these charred volumes are still owned by the Library. After the fire the Town Council offered the Library Board the old Tribune office on Main Street as alternative accommodation. Insurance money paid for the refurbishment of the property at 309 Main Street and the Library occupied that site for the next 70 years. In 2001 the Library moved to its current location at 358 Main Street. This was once the site of the Deseronto House Hotel, the possible location of the rooms rented for the original Deseronto Mechanics Institute in 1885. It was moved by Mr. Costigan, seconded by Mr. Copland that we expunge these books entirely. The Librarian was instructed that outside of these books he was hereafter to refuse no person provided the books desired were in the Library. An interesting approach to the problem! All of these once-controversial books are now freely available on the Internet, so you can see why they were considered to be inappropriate reading for some of the town’s residents by following the links on the titles to the Open Library.